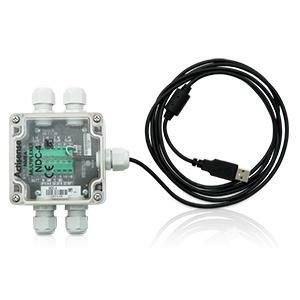 When simultaneous connection to both a PC and a NMEA 0183 device is preferred, a Actisense NDC-4-AIR multiplexer is required. The WeatherStation Instrument attaches to the NDC-4 multiplexer via the 8-pin panel port. The multiplexer's included 1.8 m (6’) USB lead outputs the data to a PC. The installer supplies the desired length NMEA output cable and battery power lead. Also, the NDC- 4-AIR multiplexer allows for 4 additional inputs of devices ranging from GPS to AIS.